Fifth grader Kayllany Costa, center, rehearses the lead role in "Annie Jr." on Tuesday at Veterans Elementary School in Gloucester. 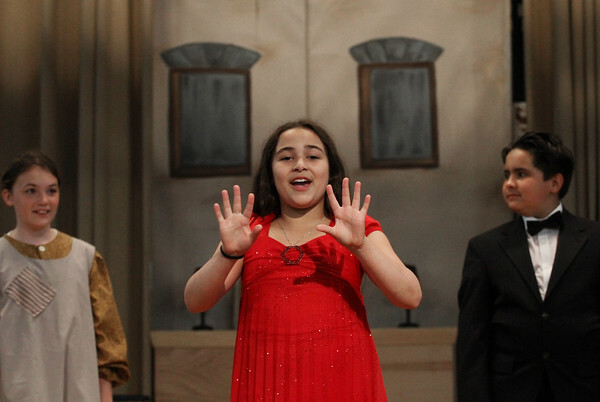 At left is fifth grader Hailey Pepin, who plays orphan Molly, and at right is classmate Farlei Marques, who plays Oliver Warbucks in the musical, which is based on the popular "Annie" comic strip by Harold Gray. The production at Veterans opened Wednesday and will conclude Thursday with shows at 1:30 and 7 p.m. Tickets are $3 at the door.